Avoid the long lines when you visit the historic Doge's Palace, the former residence of the Doge of Venice, with a local guide. Explore the Museo Correr and Venice National Archaeological Museum! Avoid the long lines when you visit the historic Doge's Palace, the former residence of the "Doge of Venice", with a local guide. Explore the Museo Correr and Venice National Archaeological Museum! Skip the long lines and enter Doge's Palace and admire this masterpiece of Gothic architecture. Explore the splendid rooms which are plastered and immersed in hundreds of paintings. This historic building is the former residence of the "Doge of Venice" who ruled the former Republic of Venice. Take line #1 and get off at “San Marco Vallaresso” stop, or line #2 and get off at “San Marco Giardinetti” stop. Once you get off the vaporetto, turn right and go straight to the two columns. 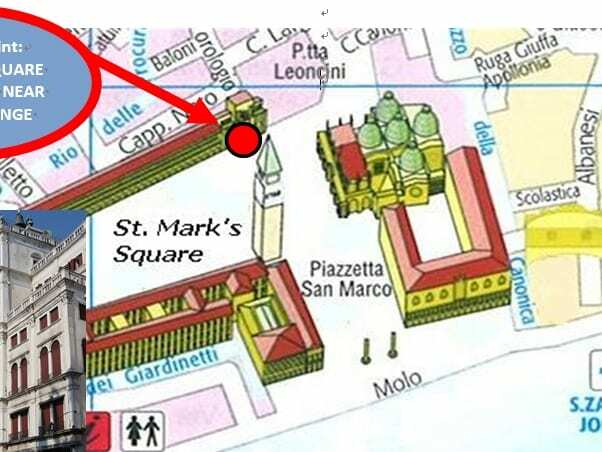 Then, turn left and reach Saint Mark’s Square. Once by the Bell Tower, leave the Basilica on your right and find the assistant waiting for you with the signboard "TOUR" under the Clock Tower. Ask the driver to take you to the “Todaro” landing stage. Once you get off, turn right and go straight to the two columns. Then, turn left and reach Saint Mark’s Square. Once by the Bell Tower, leave the Basilica on your right and find the assistant waiting for you with the signboard "TOUR" under the Clock Tower. Once by the Bell Tower, leave the Basilica on your right and find the assistant waiting for you with the signboard "TOUR" under the Clock Tower. For security reasons, sacks, bags, or knapsacks are not allowed inside the Doge's Palace. Your admission ticket also gives you access to the following places around St. Mark’s Square that you may visit by yourself: Museo Correr, Venice National Archaeological Museum, and Monumental Rooms of the Biblioteca Marciana. *The visit could be bilingual. - The afternoon tour (14:15) is in English ONLY. Any cancellations made after 10:45 local time, 1 business days prior to the activity will be subject to a charge of 100% of the total amount. My tour guide was superb! He was 6'4 so easy to follow as well. He was articulate, kind, passionate about history, art and Venice. The best tour I took on this vacation! Wonderful tour guide very knowledgeable, plenty of time to just gaze in wonder at this gorgeous palace, fabulous!